A number sequence is a list of numbers where there is a pattern. We study variations of different sequences and series, such as: geometric, arithmetic and others. We learn different formulas to find the unknown values of the term number, the sum of the terms. And the only reason we do that is to make our live easier and convert huge sequences of numbers into short and exact formulas. In the current investigation I’m going to analyze different kinds of the sequences, which include not only numbers but geometric shapes and stellar numbers as well. The aim of the current investigation is to consider different geometric shapes, which lead to specific numbers, to formulate the universal formulas to every specific group of geometric shapes and to test the validity of the gotten general statement. 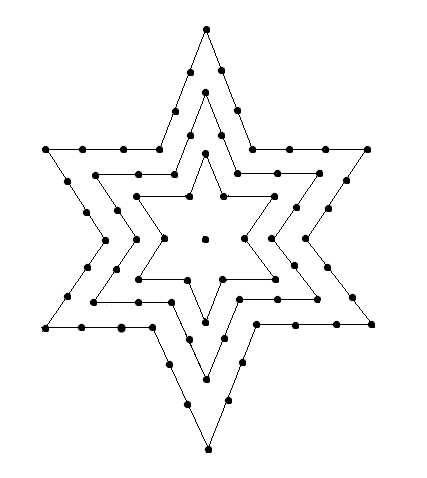 The second task is to consider stellar (star) shapes with p vertices, leading to p-stellar numbers. 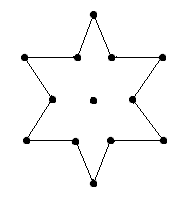 Stages S₁-S₄ represent the first four stages for the stars with six vertices. To find the number of dots in each stage up to S₆. To find an expression for the 6-stellar number at stage S₇. 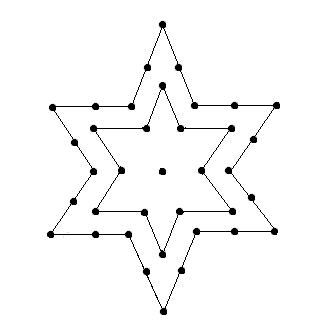 (n-1), which means that the number of dots on the each ray is subtracted by 1, because the internal vertices of the star are divided into two rays as well, so that the number of dots is not surplus. 2(n-1) is multiplied by the number of vertices (p) and the previous stage of the sequence (S ) is added. 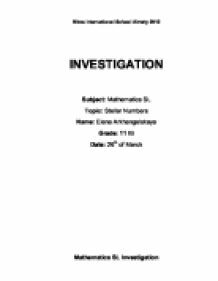 The aim of the investigation was to consider different geometric shapes, which lead to specific numbers, to formulate the general statements to every specific group of geometric shapes and to test the validity of the gotten formula. By considering different types of geometric shapes such as triangular numbers, 6-vertices stellar shapes, 5-vertices stellar shapes and 7-stellar shapes, we proved that the use of arithmetic and geometric sequences is not limited by only working with numbers, different geometric forms can be measures as well. 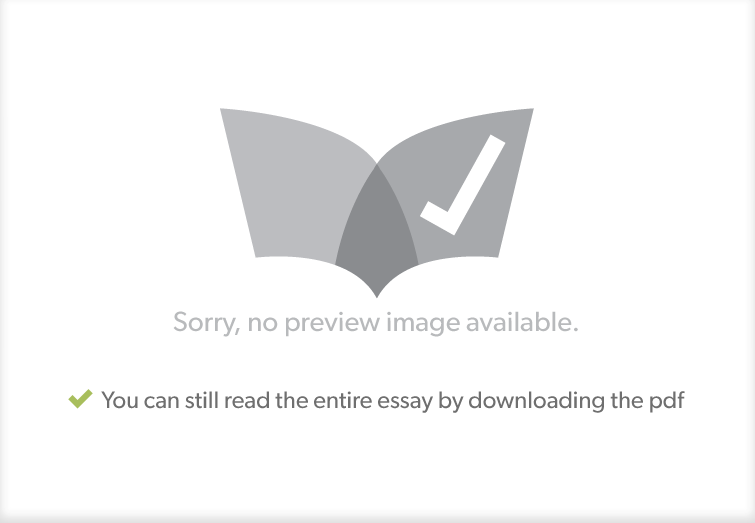 The general statement S = 2(n-1) p + S was produced, and also tested on validity and limitations. (where S6 =241 and =7) = 241+16(7-1) = 241+16(6) (multiple of 16) = 241+ 96 = 337 As done with the 6 and 5-stellar numbers, to find the general statement we must look back again to the Triangular number equation of , at this point we need to modify the equation so that it is suitable for the 8-stellar. to confirm the trends that had been seen earlier in the investigation. I then looked at these drawings and added up the number of points in each star diagram to have a more organized piece of data to examine closely. that there is no way that this can be the model, however the graph can still be manipulated to find a similar model. Again the in the equation is relevant because it was the population at the year where the data given starts. can represent this structure as a parallelogram shape, where each side has n dots. Thus, the total number of dots of the two combined identical triangular structures equals to n2 plus the additional number of dots in the extra diagonal n.
- "Graph" (www.padowan.dk) or "Grapher" (Apple Applications) - Excel (Microsoft Office) - Paper, pen or pencil - Areas of interaction sheet with instructions and procedures Procedures and methods Even though it is important to have the items mentioned above, it is also very important to follow some easy steps that will conclusively help you achieve the correct answer. + 1 = 21 --> Using n=7: n2 + n + 1 = 36 (7)2 + (7) + 1 = 36 With proof that the formula works it is concluded that the general statement for this pattern is: n2 + n + 1 2.